John Wick: Chapter 2 tackles a burning question: What about the dog? The John Wick: Chapter 2 panel addressed a question on everyone’s minds: What’s going to happen to the assassin’s new furry pal. 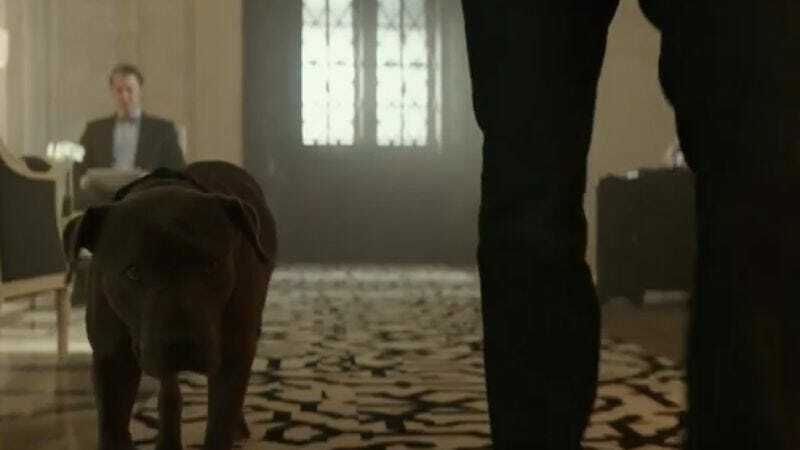 The adorable pit bull John picks up at the end of the first movie made an appearance in the trailer for the new installment—after all, the sequel takes place four days after the events of the the inaugural John Wick. But will the pup meet the same fate John’s Beagle companion did? (We hope not.) Producer Basil Iwanyk explained to the crowd that when he told people that a sequel was in the works, “the first question was, ‘you’re going to kill the dog again?’” But Iwanyk was reluctant to reveal any specific details. “Needless to say, we kill about 80 Italians in the movie,” he said. “And you guys will see what happens to the dog.” That comment was met with protests from the audience. “It’s great,” he said. The panel also introduced Common’s not-quite-villain—“We have different points of view,” Reeves said—and teased a Matrix reunion. Laurence Fishburne appears as as a man who director Chad Stahelski called “one of John Wick’s pseudo allies.” Stahelski added that the character was written with Fishburne “in mind,” and then Reeves helped recruit the actor when they ran into one another at a “social function.” John Wick: Chapter 2 comes out February 10, 2017.